Blizzard warnings are in effect today from Nebraska to Minnesota, as heavy snow and strong winds bring whiteout conditions to the Plains and Midwest. The heaviest of the snow is expected in eastern Kansas and Nebraska, southern Minnesota, northern Wisconsin, as well as the Upper Peninsula of Michigan, where the forecast calls for 1 foot of snow. Travel is expected to be dangerous in those areas through the evening rush and into late tonight before clearing out overnight. Sarah Wilson walks down the hill along Kellogg Avenue in St. Paul,. Minn., with an umbrella to shield the wind and snow, Jan. 22, 2018. A Nebraska Department of Transportation sign warns drivers of winter weather on Interstate 80 East on the edge north side of Lincoln, Neb., Jan. 22, 2018. In Minnesota, Mankato and Owatonna both saw 6 inches of snow this morning, according to the National Weather Service. In Mankato, Mike Davis with Mankato Snow Removal told ABC News he has a crew of 20 men “working hard” to clear all the heavy snow from sidewalks in the downtown area today. The weather is causing major problems for travelers. The Minneapolis-St. Paul Airport closed its runways today and in Chicago, at least 50 flights at O’Hare International Airport were canceled Monday morning because of the weather. 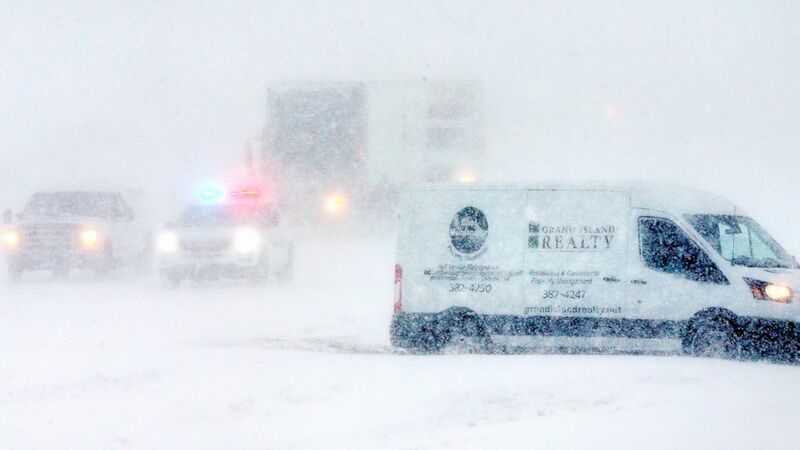 In Iowa, the snow and winds forced officials to shutter a portion of Interstate 29. The Minnesota State Patrol posted these photos after a car crashed through a fence on a roadway in Rochester. Showers and thunderstorms are moving through the Southeast from Tallahassee to Jacksonville in Florida, and up to Atlanta. By this evening, snow and ice are expected to make its way into Northern New England. The snow glistens in the mid day sun on trees in Andover, Mass., Jan. 18, 2018. On Tuesday, heavy rain is headed to Washington, D.C., Philadelphia, New York City and Boston. The heavy rain is expected to mix with warm temperatures, potentially leading to some isolated flooding and ice jams in the Northeast. The rain will move out before the evening rush hour. By Tuesday evening, some lake-effect snow is possible in parts of western New York, Pennsylvania and Ohio. The January warmth will continue for the East Coast Tuesday, with temperatures in the 50’s in the Northeast and upper 60s in the Southeast. Temperatures will slip mid-week, before yet another warm-up for the East Coast by the weekend. Before the snow struck the Midwest and the Plains, a winter storm on Sunday blanketed areas near Denver with several inches of snow, causing treacherous travel and road conditions. Jennifer Robbins of Denver cross-country skis with her chocolate Labrador named Koa in Washington Park, Jan. 21, 2018, in Denver. Heavy snow led to about 200 flights at Denver International Airport to be canceled, representing about 15 percent of its daily operations. The Denver airport received about 6 inches of snow, while some of the hillsides saw totals closer to about 10 inches. ABC News’ Andy Fies and Adrienne Bankert contributed to this report.